I love fresh fruit in season and right now I am enjoying peaches. Last year I bought a new cookbook by Rosie Daykin called Butter, which is also the name of her bakery. 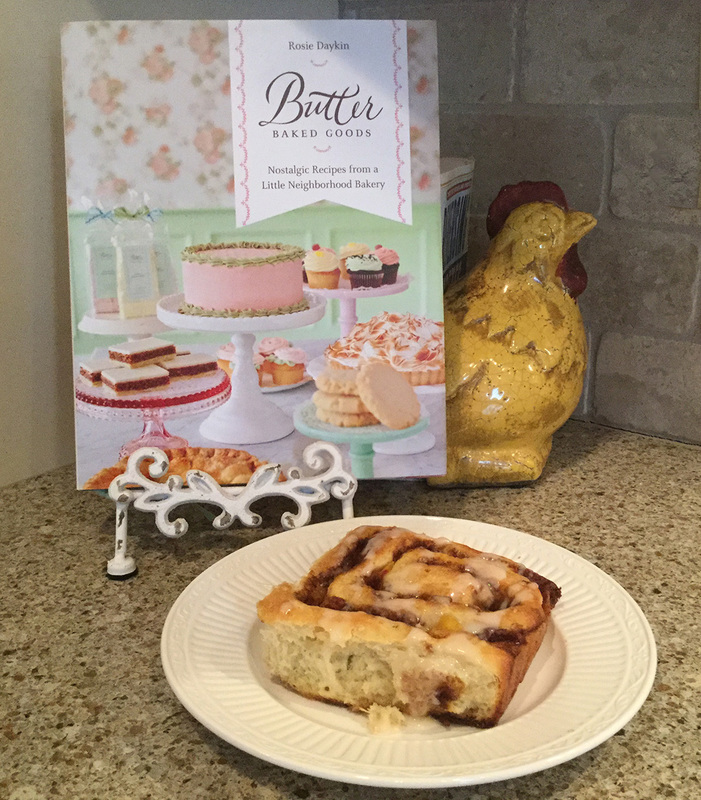 So far I have only tried one recipe in the book which are her cinnamon buns made with peaches and pecans. They are so yummy that I have made them at least a half a dozen times. I like them with fresh peaches but they are also good with canned or frozen peaches if you are craving them in the off-season. Mix up the dough and filling following the recipe. My secret ingredient that I use is Vietnamese Cinnamon instead of regular cinnamon, it has a more intense flavor, that I like. I get mine from King Author Flour, I am sure that you can get it other places. I then like to get my pecans toasted so they are cool before assembling the rolls. Once your dough rises you will roll it out into a 18″ x 14″ rectangle. You will then add the filling, nuts, and peaches and roll the dough from the long side. Let them rise and then bake them. Follow directions for removing from pan. In the meantime mix up the glaze. I just add a little vanilla instead of the bourbon in the glaze. Drizzle icing on cinny buns and enjoy. These are a light flavorful cinnamon bun that isn’t overly sweet. Rosie also makes them with other fruits and nuts. I have made them with apples and they were just as yummy. They do take a little time but are worth the effort. The recipe follows along with a printable version. There are some other recipes that look wonderful so I encourage you to check out the cookbook. In a stand mixer fitted with a dough hook or paddle attachment, place 5 cups of flour and the yeast and set aside. In a large saucepan, combine 1/3 cup of the butter, the milk, granulated sugar and salt. Stir over medium heat until the milk is warm and the butter is melted. Add the warm milk mixture to the yeast and flour and mix on low speed until incorporated. Add the eggs and continue to mix for about 6 to 7 minutes until the dough is shiny and smooth. Lightly butter a large bowl and place the dough in it. Cover the bowl with a sheet of plastic wrap and place in a warm spot away from any drafts. Allow the dough to rise until it has doubled in size, about 90 minutes. Note: Buttering the underside of the plastic wrap is a good idea to stop the dough sticking to it as it rises. I like to cover the bowl holding the rising dough with a clean tea towel to keep it warm. Meanwhile, prepare the filling: In a stand mixer fitted with a paddle attachment, cream the remaining 1 cup of butter and the brown sugar on medium high speed until light and fluffy. Turn the mixer to low and add the ½ cup of flour and the cinnamon and mix into a soft, spreadable paste. Once the dough has fully risen, remove the plastic wrap and punch down the dough in the bowl to release the air produced by the yeast. Turn dough out onto a lightly floured board and allow it to rest for about 10 minutes. Spread the pecans on the cookie sheet and toast in the oven at 3500F for 7 to 10 minutes, until nicely browned. Flip the nuts with a metal spatula at the halfway point to ensure even toasting. Remove from the oven and allow to cool. Transfer the dough to a lightly floured work surface and use a large rolling to roll it into a large rectangle, about 18 x 14 inches and about ½ inch thick. Use a small offset spatula to spread the cinnamon paste evenly to the edges of the dough. Sprinkle the peach pieces and toasted pecans evenly on top of the cinnamon paste. Carefully roll the dough up into a long log starting from the 18-inch side. Use a large, sharp knife to cut the dough into 12 equal rounds. Place the rounds on the baking pan, sliced side up and cover the pan with another piece of plastic wrap. Set in warm place to rise until they again doubled in size, about 90 minutes. Bake in the preheated oven for 20 to 25 minutes or until the buns are a lovely golden brown and not sticky in the center. A wooden skewer inserted into the center should come out clean. Remove from the oven and allow the buns to cool slightly, then turn them out of the pan onto a cookie sheet. Place a second cookie sheet on top of the buns and flip them over again. This brings the buns right side up on the sheet, ready for glazing. Prepare the glaze: In a small bowl, whisk together the icing sugar, cream, bourbon, corn syrup and vanilla until the mixture becomes a nice running glaze. Use the whisk to dribble the glaze over the top of the cinny buns – as much or as little as you like. To save yourself time in the morning, prepare the dough the night before. Follow the recipe to step 12 (covering the dough with the plastic wrap) and then place the pan in the refrigerator overnight. Remove in in the morning in time to do the second rise of the dough (90 mins) and then continue with the recipe. This will give you extra-fresh, warm cinnamon buns, perfect for a special celebration or just because it is Saturday. They are yummy, hope you can try them!